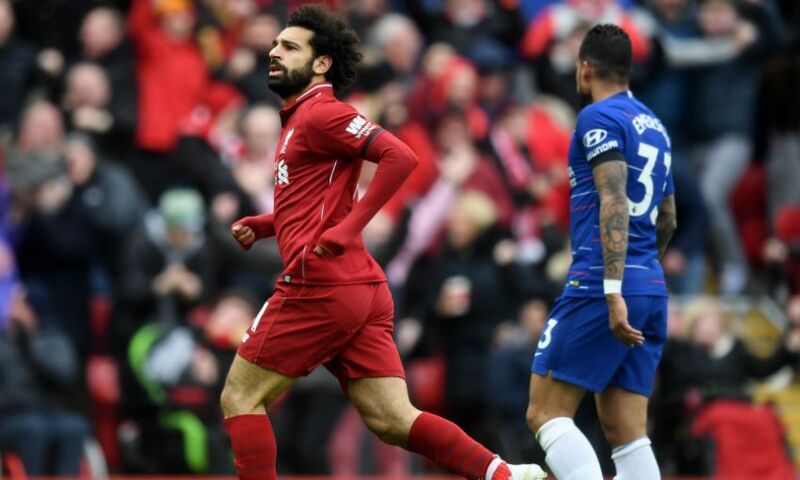 Mohamed Salah's goalscoring instinct took over right before he unleashed a rocket to score Liverpool's second in the 2-0 win over Chelsea on Sunday. Just 142 seconds after Sadio Mane's opener, the Egyptian doubled the Reds' lead with a spectacular long-range effort that sent Anfield into raptures. It took Salah's Premier League goal tally for the season to 19 - pulling him level with Manchester City's Sergio Aguero in the Golden Boot race. "I don't think, I just feel!" the No.11 told Sky Sports. "Normally I shoot [with the] inside of the foot but this one - because it's far [out] - I just hit it with power. Despite being a certain contender for goal of the season, Salah doesn't even rank it as the best of his Liverpool career. Instead, the curling effort in last season's Anfield Merseyside derby - which won the 2018 FIFA Puskas Award - remains the forward's most beloved. "I will always chose [the Everton] one," he added. "This is my favourite because it's my first derby. "I think I used everything good - the strength, the technique and the skills."